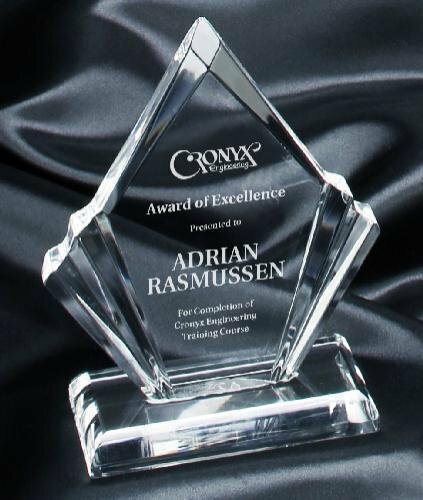 The Fenix Crystal Award is clear and cobalt blue, made of optic crystal. The prestigious Nik Meller Collection uses only the highest quality optic crystal. These crystal awards, artistically inspired & designed by Nik Meller, are hand crafted works of art made by the finest crystal craftsmen. Each piece is etched w/the designer's signature to ensure design authenticity. Angled clear cristal sits on a blue base. Fine Format 1 is part of the Haertling Collection designed by international designer John Haertling. 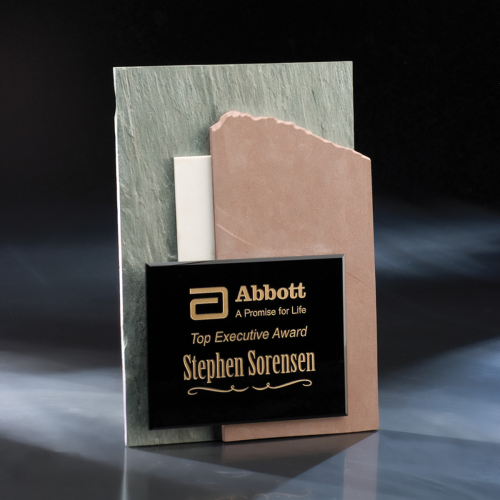 With a combination of brown stone, along with a black glass plate make this a beautiful modern piece. 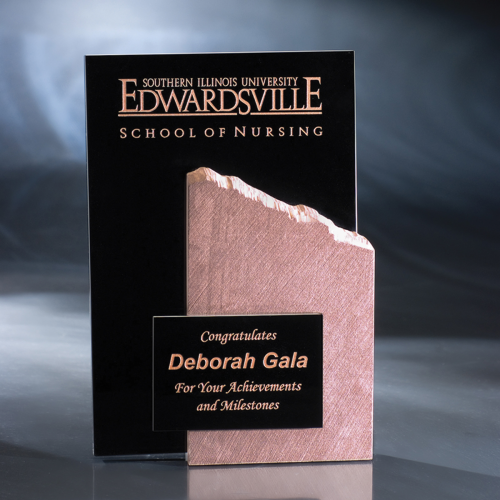 The piece consists of a black crystal back followed by a brown stone and black crystal engraving plate in the front. Fine Format 2 is part of the Haertling Collection designed by international designer John Haertling. 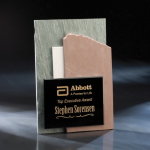 With a combination of brown stone, along with a black glass plate make this a beautiful modern piece. The piece consists of a black crystal back followed by a brown stone and black crystal engraving plate in the front. Fine Format 3 is part of the Haertling Collection designed by international designer John Haertling. With a combination of green, white and brown stone, along with a black glass front plate make this a beautiful modern piece. The Nik Meller Collection of elegant premium grade optic crystal Awards are designed by International furniture designer and sculptor Nik Meller. The Firefly Crystal Award promotes a unique design with a red accent flare. Available in three standard sizes.